The forces involved in machining can be considerable, particularly high speed machining. Secure work holding is necessary to ensure components are help in place in confidence so you can get on and complete the job. 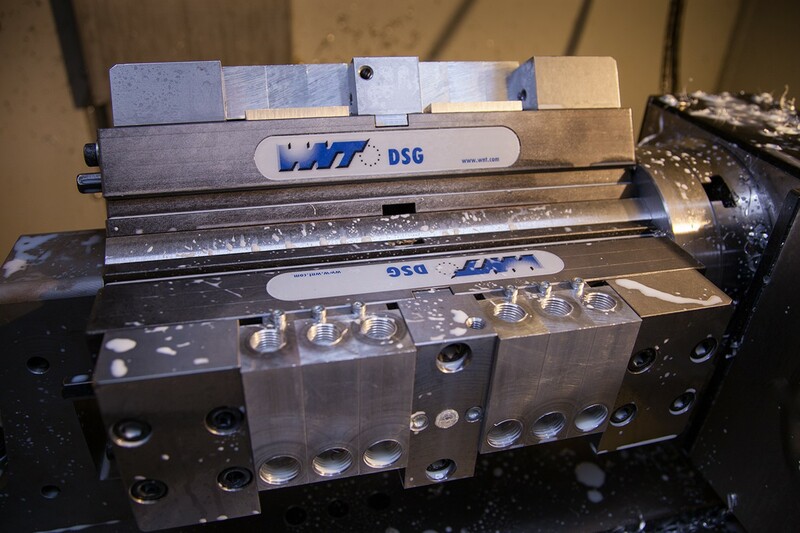 Workholding solutions vary considerably from simple clamping, through to custom designed jigs and fixtures for parts with complicated geometry. Workholding secures, locates and correctly orientates the workpiece in the position any CNC operation will expect to find it. Other purposes include ensuring the part is adequately supported, as well as being rigidly held and accurately positioned. Ideally the workholding solution you chose will enable access to the part for as much machining as possible without the setup being changed. Clearly this has an impact on productivity and machining cycle time. This page provides some background to workholding, as well as looking at a range of solutions out there. As a machining topic that is often overlooked, thorough workholding consideration can significantly reduce set-up and machining cycle time. In turn, this reduces costs per job, whilst raising productivity and profit margins. For small manufacturers, workholding considerations make business sense. This guide by Kurt Workholding looks at a range of topics to ensure your workholding solution is as productive as possible. Points include principles of workholding, vices, design and operational considerations. Additional areas covered include workholding planning (products and accessories), as well as selecting the best available vice, clamp and set up solution. Further technical explanations are also featured. Definitions and descriptions of jigs and fixtures for clarity. Background information about how they are an important part of production engineering, together with design for production principles. Common practice examples are provided, together with typical materials and advantages. Although broadly focused on the aircraft industry, this useful guide is applicable to any industry sector. Workholding practical introduction and explanation courtesy of SME. This short video features the principles of workholding from a milling, machining center and lathe perspective. Production engineering considerations are included such as speed of set-up and disassembly, as well as the requirement to undertaken the maximum amount of machining with each workholding configuration. CNC Lathe Workholding Considerations (Courtesy of Okuma America Corporation). Workholding for cylindrical parts is often overlooked, in favour of solutions for milling machines. This short video describes typical solutions such as 3 Jaw chuck options, quick change set-ups, the latest face drivers and available collet systems. Vacuum Table Workholding Solution (Courtesy of Vacuumtishe DE). A multifunctional vacuum table with flexible workholding options. The solution features a grid and threaded bush system. This enables additional clamping methods to be attached in-situ such as vices; therefore allowing operations which typically can't be undertaken on a vacuum system. A highly flexible system that is quick and easy to configure. Earth Chain lifting magnets and magnetic vices are great for fast setups and automated machining. Capable of effortlessly moving large work pieces into position, before rigidly retaining them with zero movement during machining. Magnetic workholding options provide deceptively secure solutions, particular for heavy cumbersome items. Multiple Part Workholding (Courtesy of Paws Workholding). Workholding clamping solutions capable of clamping multiple parts, quickly and conveniently. The emphasis is very much on reduced set-up time and minimising the number of tool changes. The time saving and advantages for the operator are emphasised. Ultimately this reduces the cost of production, and therefore the return on investment.